We also explored the encouraging statement made by Katja Borregaard, an educator at Skt Josefs Skole in Roskilde, Denmark, that one doesn't have to be a gamer or expert to get started. some blocks ignore gravityMost blocks are 1 metre cubed, except for non-standard ones such as slabs and stairs. some such as lava and water have animated textures. What happens to these blocks? They can be moved and placed wherever one wishes to put them, and they can also be destroyed if necessary. The only limit in a Minecraft world is the player’s imagination. 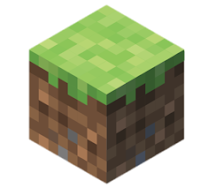 flat, which generates an infinite plain of grass blocks on top of a few layers of dirt and bedrock. Mesa with its striped variants of clay and desert features. A player is a character that can be controlled. There are two default player skins, Alex and Steve. Aplayer in Minecraft can change their skin to any of the available Education Edition Skin choices. A player is 1.8 blocks tall, and walks at a rate of 4.3 blocks per second. Players in Survival mode have health and hunger meters, and they can walk, run, sneak, fly, or swim throughout a Minecraft world. Another fun fact is that in Minecraft, the sky rotates directly around the player, which includes sun, moon, and stars, so you can truly say “the sun revolves around me”. There are two of the main game modes in Minecraft. Survival mode is the standard game mode. prevent damage from the environment and fight hostile mobs in order to survive. The player also has health and hunger bars with 20 points. At full hunger, health can regenerate, but if hunger drops too far a player can starve and lose health. Additionally, without using commands players cannot fly in Survival mode. In creative mode the players have the ability to easily create and destroy structures. Players are given an infinite amount of blocks of all types, as well as no health or hunger bars to hamper them. Players are able to destroy all blocks instantly. Finally, are neutral and will do no damage to the player. This can be controlled further by setting the world to always day. As mentioned worlds are made up of the Overworld and Nether. The Overworld has a day-night cycle where a day consists of 24000 ticks, equivalent to 20 minutes of calendar time. 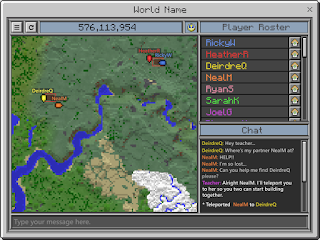 In Creative mode, a player can set a Minecraft world to be always day, but in Survival mode, a player must use commands to reset time to a specific spot. Of the 20 minutes of a Minecraft day, daytime is 10 minutes, dusk and dawn are each 1.5 minutes, and nighttime is the remaining 7 minutes. If a survival world is set to anything except peaceful, hostile mobs will spawn during nighttime as the light level is at its lowest point. There are even phases of the moon in Minecraft during an eight day cycle, so brush up on your waning crescent and waxing gibbous definitions. Griefing and griefers are a part of Minecraft. Some players like to do the opposite of what they are supposed to do and destroy a classmate’s creation or go their own way and ignore the learning objectives. The best thing to do with these players is to give them responsibilities and leadership opportunities within the game. This focuses their energy to be more collaborative. Minecraft provides an excellent opportunity to discuss digital citizenship, and how destruction of digital creations is no different than tearing up a classmate’s painting or ruining their classwork. How much control does an educator have in Minecraft: Educaton Edition? Here are a few of the ways educators can be part of the game and have some control over what is happening. Minecraft: Education Edition has provided lessons spanning primary, intermediate, and secondary school for use with students. Existing curriculum could also be adapted to use Minecraft: Education Edition. 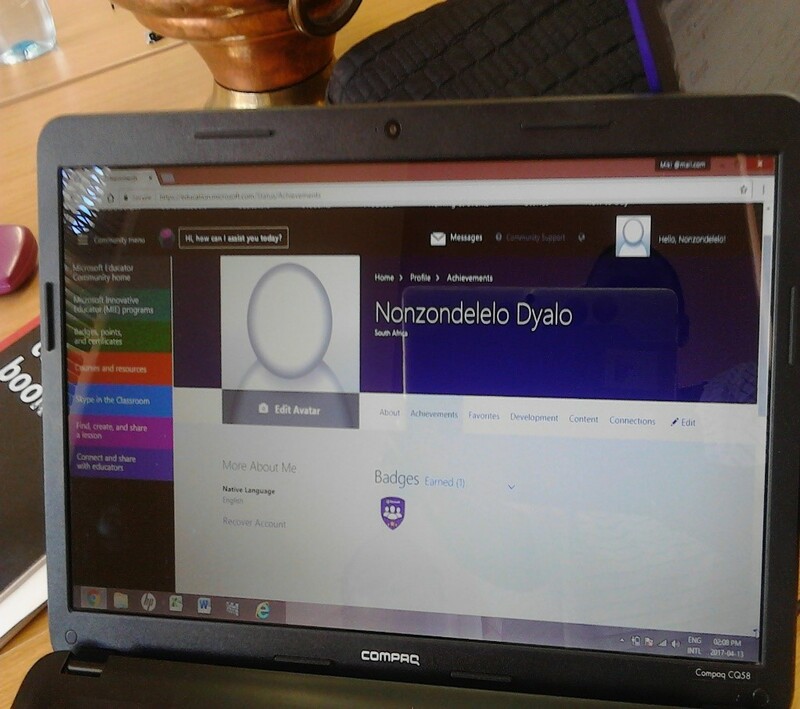 Students are able to personalise their avatars by using one of the available skins. This increases student engagement and enables the educator to differentiate between students who are playing together. A whole class can play together. The “Friends” tab enables students to collaborate in small or large learning groups and create and learn together. Educators can make use of these to set editable or read-only areas of the world – allowing, or denying students the ability to build and focusing the learning to specific spaces. Border Blocks help eductors define areas in the game that their students can build and play in. Fixed Inventory Slots provide educators with an opportunity to define specific inventory available to students, such as a camera, portfolio, or other blocks or tools. A Non-Player Character, or NPC, can be placed in the game to provide information to students, give direction, and link to other resources. Educators can use 3 different sized chalkboards to communicate learning goals, or challenge students with problems to solve within the game. Classroom Mode is a partner application that empowers educators to interact, monitor, and facilitate purposeful learning for one or many groups of students. 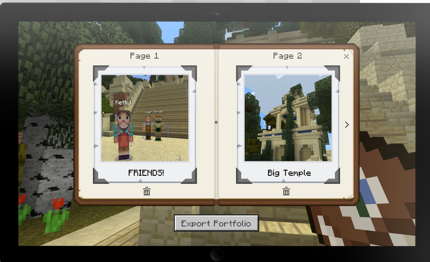 The portfolio is a place where students can save the screenshots they’ve taken with the Camera and add notes. Why not introduce Minecraft: Education Edition at your school? Identity: Office 365 Education account for each player. This is free for schools and your Authorised Education Partner can assist you getting this set up. The 2017 ISPA SuperTeacher Competition is an annual competition sponsored by the Internet Service Providers’ Association (ISPA). The competition is managed by the Digital Education Institute. All educators currently teaching at schools throughout South Africa. 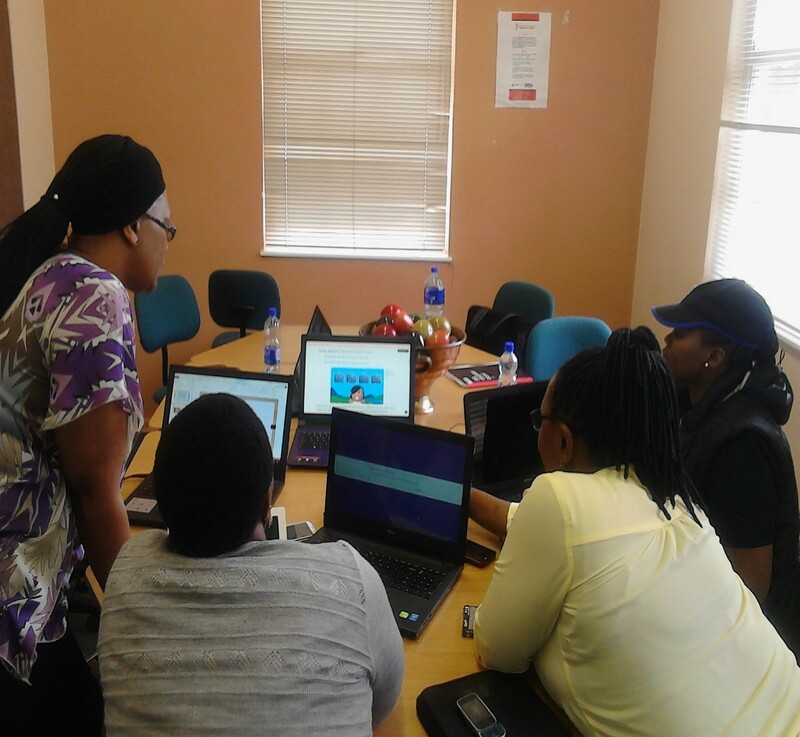 The ISPA SuperTeacher Competition gives educators an opportunity to showcase their skills in using Information Communication Technologies (ICT) to improve the educational environment within their classroom, school or community. This prestigious competition has a proud history going back to 2001, when ISPA launched the competition, to support their Train the Teacher ICT Project. There are a number of categories that one can enter. These are shown on the competition website. This year we hope to extend the competition to include more teachers and reach more schools and communities. We have also introduced a mobile safety category catering to the ever growing use of mobile devices in and out of the classroom. Each of the ten finalists will receive an all-expenses paid, two day trip to iWeek and the ISPA SuperTeacher Awards Ceremony in September 2017 which will be held in Durban this year. Here is a message from Michael Cameron, the South African manager of the Computer Olympiad. "There is still time to let us know how many of your computer literate learners will write the 2017 Applications Olympiad. Entry is free - no need to collect money. Learners can write online (no marking for you). For offline they fill in one-word answers to 25 questions, so marking is fast and you can give immediate feedback. Participants quickly see that there is always more to learn about word processing, spreadsheets, databases and presentations. In the week after the Olympiad you receive model solutions allowing you to extend their thinking and efficiency. The Applications Olympiad First Round runs for one hour anytime in the week 8 – 12 May. It is easier than in 2016 but it does also test computational thinking. The top 50% in the country will receive Bronze, Silver or Gold Certificates. Round 2 on 7 June is for top performers. It is by invitation and will be more challenging to extend those who are in line go to the Finals (4 and 5 July) or to receive provincial certificates. If you enter now, instructions will be sent to you next week, including data files for uploading for the Olympiad. To enter, use the form below and send to info@olympiad.org.za or fax it to 021-447-8410. 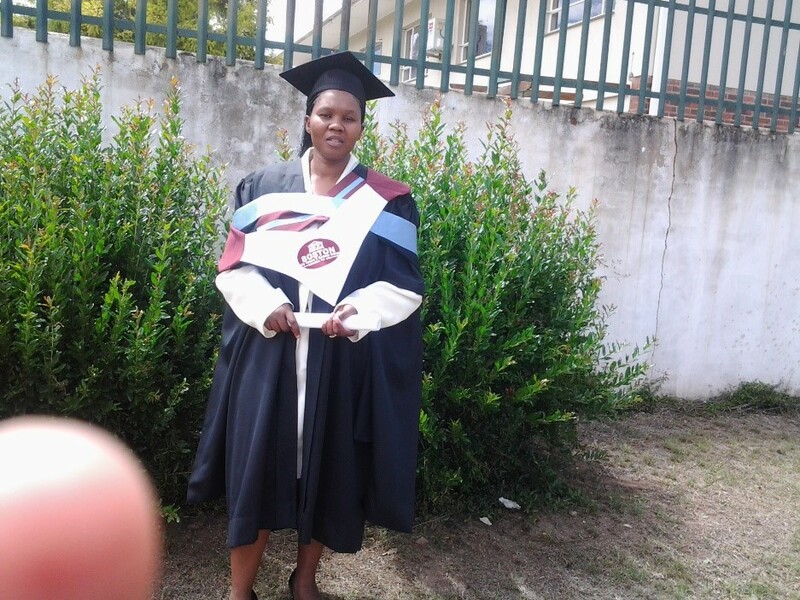 This is a guest post from Nosithembele Gcobo from Queenstown in the Eastern Cape in South Africa. Nosithembele is one of our Microsoft 2016/2017 #MIEExperts. 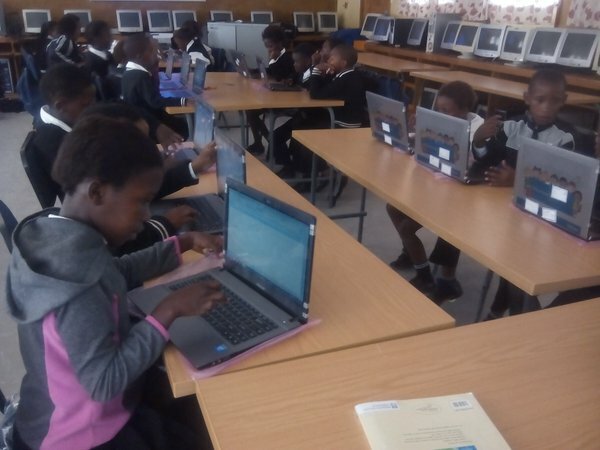 Nosithembele was very excited about a recent event that took place as a result of her posting Microsoft tools posts and technological updates on her Facebook page. 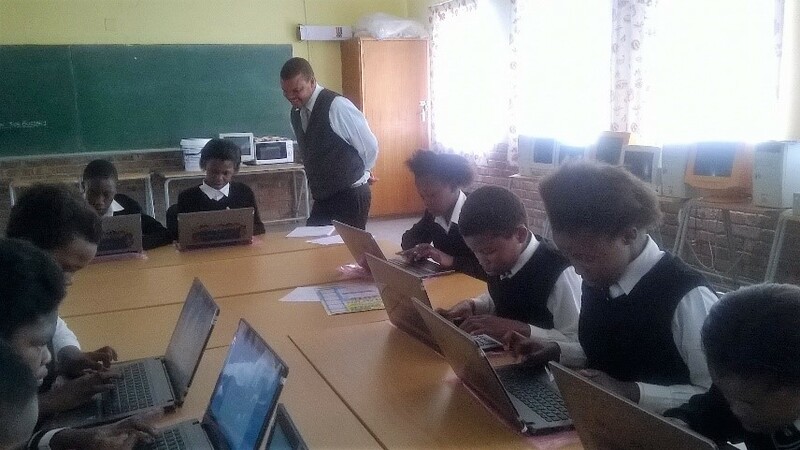 She was contacted by some teachers from the Butterworth district, which is about 150 kilometres from Queenstown, to see if she could upskill them with what she has been learning regarding using Microsoft applications in her classroom. 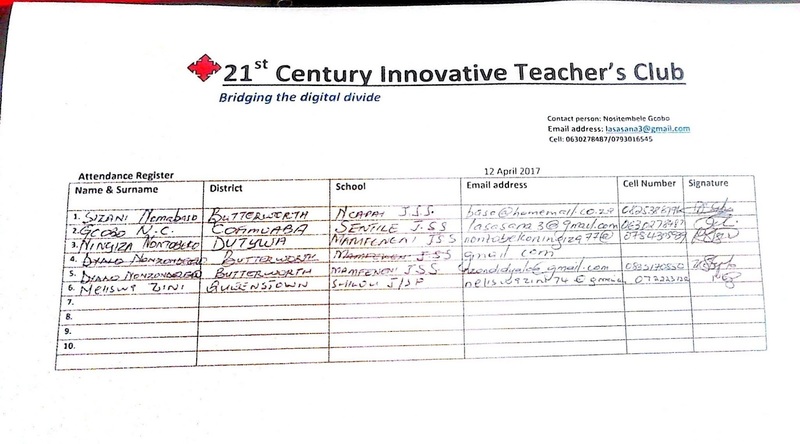 This gave her the idea of starting a 21st Century Innovative Teacher's Club and inviting them to join. They were prepared to drive all the way from Butterworth just to spend some time updating their skills. Nosithembele sent this report back of the weekend. "I post most of my Microsoft posts on educational tools to be used in classroom integration on my Facebook wall. As a result I receive many followers who show interest. Some of them started a conversation with me through WhatsApp since they are many kilometres away from me. They decided to pay me a visit so that we can collaborate and share our ideas, since they are the beginners in this ICT integration journey. It was then that I decided to form a club! 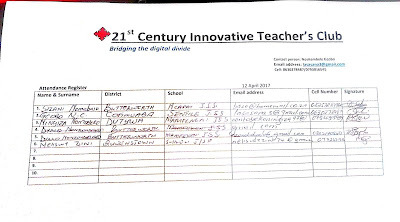 I called it The 21st Century Innovative Teacher’s Club. I recruited Nelisa Zini, who is also a MIEExpert from the Queenstown district, to be a member of the club so that we could both empower the other teachers about the integration of technology in the curriculum practice. My dream came true on the 12 April 2017 when the club had its first meeting. 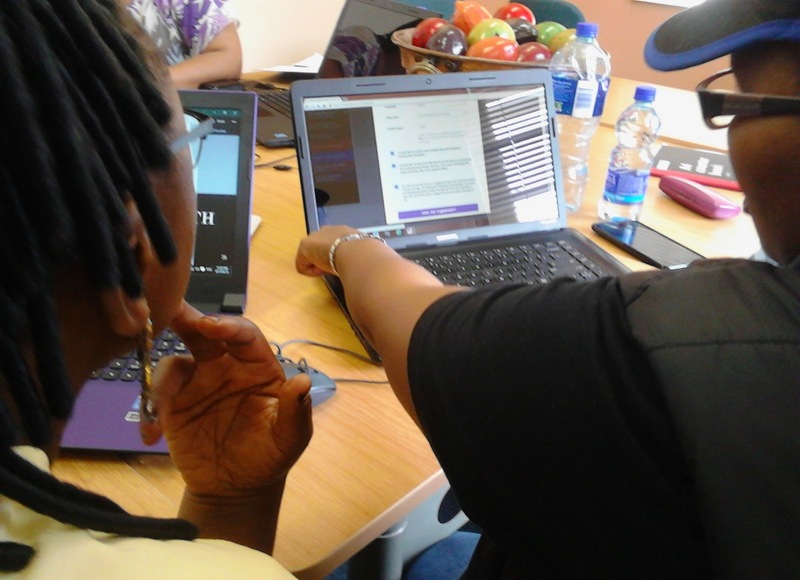 The three teachers drove 185 km from Butterworth to Queenstown, just to be empowered! It is really a small world. I discovered that two of the teachers were once my high school classmates at Daliwonga High School in Cofimvaba! We matriculated in 1987 and we never met or communicated after that. What an innovative reunion we had! They are beginners as far as technology is concerned, but they have the passion and willingness to know more about ICT integration. Their learners have no devices but their schools have some ICT infrastructure like laptops for a few teachers and a screen and projector for some. These teachers use their own personal routers so that poor Internet connectivity cannot be a barrier. They really inspired me with their enthusiasm and gave me the desire to adopt them technologically. I first introduced them to the Microsoft Educator Community so that they would be able to access all the information, courses and resources that are available. I wanted to show them, how to earn badges and everything like that. The introduction was a very big success as two of them managed to register. One gained three badges and a certificate, the other gained one badge, and they acquired some points. The third teacher had a problem and it took a while for her to get registered. Our collaboration journey began with learning how to use Sway and OneNote. The teachers were very excited as they had never heard about Sway and OneNote before. 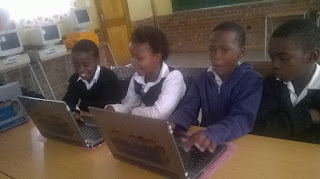 I showed them my lesson presentations on Sway and OneNote. They were amazed to find you can make a beautiful presentation in Sway, and you can even insert video clips for the learners to watch while you are presenting. I showed them how you can download the CAPS document to your Documents folder instead of carrying and manually paging through a ragged document when doing lesson plans. They started creating their own Sway presentations for their English and Mathematics lessons. They were able to insert pictures, graphs and everything else needed for their lessons. 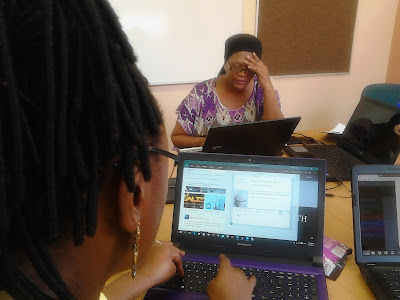 They mastered how to browse for relevant videos for their lessons. .
Nondzondelelo Dyalo from Butterworth district creating her first Sway presentation. 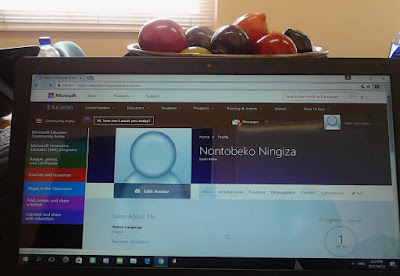 #MIEE Nelisa Zini showcased her English lesson plans and movie-making lessons on book reviews as well as her Natural Sciences and Technology lesson plans which she had done using Sway and OneNote. She kindly shared most of her lessons plans with the club members since they taught the same grade and subjects. We agreed to meet quarterly in the future because of the distance, but we will continue with online communication and collaboration with each other. I asked for an evaluation from the teachers and I am glad so say that I made an impact in their education career. I am more than willing to run the race with them. They gained a lot from our first meeting. They even completed a quiz from one of Microsoft Learning Paths - Digital Literacy - and received badges. I designed a logo and a slogan for my club to make it legitimate. It is my dream to run this club for the rest of my life – I found it to be food for my soul, doing what I love most! The logo has four arrows pointing to the four directions, which means "Through ICT integration in curriculum practice, we are not limited. We can go in any direction". The slogan “Bridging the digital divide“ means: "Even though we are the underprivileged province because of our rurality, we can still bridge the gap between the urban and the rural context if we can be fully supported by one another. This means not only not just providing one another with digital resources, but also making sure that we are well equipped, monitored, supported and guided in the use of ICTs". I am hoping that this club will expand for the benefit of the teachers, as this was an excellent beginning. We signed an attendance register for the sake of record keeping. You can see the logo and the slogan on the register below. My appreciation goes to the librarians of WSU Resource Centre, Frontier Hospital in Queenstown for allowing us to use their board room for our collaboration. We were comfortably hosted, with privacy, and we were not interrupted by the principal users (the board room is used by the Health Department). My appreciation also goes to the SchoolNet team, for believing in me by unlocking my potential. If it were not for you my dream would have died. Your SchoolNet newsletters keep me going. They are the source of my inspiration. My appreciation also goes to Microsoft. Thank you all ever so much once again. Here are two more photos of this memorable day." We'd like to pass along an opportunity for educators at independent schools in South Africa to take part in an international survey. The Clayton Christensen Institute is conducting a study on technology use in education systems around the world, with South Africa as a focal point. Once you complete the five-minute survey, you will be entered for a chance to win a signed copy of Blended: Using Disruptive Innovation to Improve Schools. If you have any questions, please direct them to Jenny White jwhite@christenseninstitute.org. Thank you very much. This survey is conducted by the Clayton Christensen Institute with support by SchoolNet. Microsoft is excited to announce the availability of Minecraft: Education Edition in South Africa! This is the third post in a series of posts about using Minecraft: Education Edition in your classroom. (The series of posts can be accessed at: http://bit.ly/2pRigwJ). In this post we explain why Microsoft is excited to announce the availability of Minecraft: Education Edition in South Africa! We give details of why you should think about using Minecraft: Education Edition at your school, and how to go about purchasing it. Easy Classroom Collaboration: Educators have told us that one of the greatest benefits of Minecraft: Education Edition is the ability for students to collaborate together to build projects and solve problems. Chalkboards: Creators can use chalkboards to communicate learning goals, provide additional information and give explicit instructions within the game. Minecraft: Education Edition immerses students in a virtual landscape that fosters collaboration, stimulates problem solving, and inspires creativity while exploring subjects from art to math, history to science. 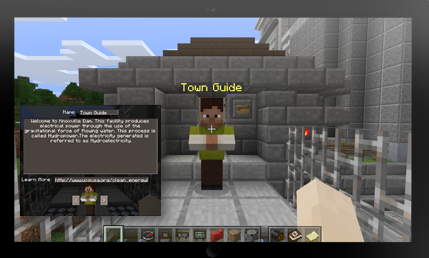 Minecraft is already transforming classroom learning! Hear what educators are saying about using Minecraft to transform classroom learning in the video below.. Between 28 February and 2 March 2017 Megan Rademeyer, SchoolNet SA Programmes Manager and Microsoft Fellow had the opportunity to attend the Minecraft: Education Edition training partner summit in Dubai. Sessions included “Learning how to play Minecraft”, engaging in a “Build Battle” (where teams built structures together to try out-build other teams), and exploring “Classroom Mode in Minecraft: Education Edition”. The aim of the training session was to certify trainers from Microsoft Training Partners who will them be able to run Minecraft: Education Edition training sessions with schools. In addition to Megan, representing SchoolNet SA, Dominique Cave and Jethro MacDonald from Computers 4 Kids and Elsabe Hart, a Microsoft Teacher Ambassador were the other South Africans in attendance who are now certified Minecraft: Education Edition trainers. Megan’s favourite session was Minecraft: Breakout Edu which involved going through a Minecraft world and following clues to unlock various puzzles. This activity provided teams with an opportunity to collaborate with others, and use Minecraft and thinking skills to work through an engaging challenge. This session would be a good one to run at schools as teachers and/ or learners who have some Minecraft skills could be grouped with novice Minecraft players. The challenge required a range of skills and someone who is not a Minecraft expert could still help solve puzzles whilst being exposed to Minecraft at the same time. Other worthwhile sessions involved learning the basics of Minecraft by working through the Minecraft: Education Edition Tutorial World. This activity would be a good place for teachers and students who are unfamiliar with Minecraft to learn the basic controls and features of Minecraft, such as gathering and crafting resources. Minecraft: Education Edition is similar to Minecraft that many of your learners may already know and love. What makes Education Edition great for teachers is that it utilizes Office 365 to assign Minecraft accounts to students – making it a cost effective way for schools to access the game, and in a way that provides a safe, closed environment in which to play. Features such as the camera and portfolio resources make it easy for learners to document evidence of learning or of structures they have created. 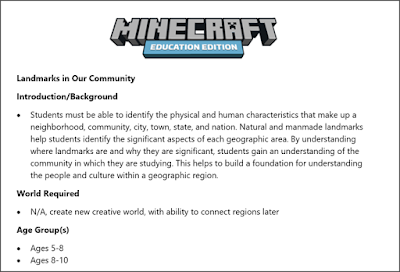 Even if a teacher does not have Minecraft: Education Edition, the Minecraft: Education Edition portal provides free access to range of lesson plans, pre-built worlds and ready-made activities that make it easy for a teacher to integrate Minecraft into a lesson. Before heading for Dubai, Megan was a complete Minecraft novice, but she is happy to report that spending after spending a few days playing Minecraft she is no longer accidentally destroying quite as many blocks as she did at first! More importantly, she has realised that one does not need to be a Minecraft whizz to use this tool as part of a fun and engaging lesson. Below are some lessons about Minecraft that Megan learnt during the training summit. My daughter (now 11) has been playing Minecraft for about two years. My sole contribution to her interest in the game was providing my credit card details so that she could download Minecraft: Pocket Edition to her tablet. Every so often, she would me a hotel, or a dream house or a stadium that she has created and I would say something like “that’s lovely sunshine, now how about you go read a book or do some homework.” Now that I have actually tried to make my own house in Minecraft I am in complete awe of the structures she has been able to produce. Without having been on a course, with no instructor and with no manual to tell her what to do. Kids take to Minecraft naturally – maybe because they aren’t afraid of failure and are willing to just give it a try. I can touch-type. I can produce professional looking reports using Word far more quickly than if I were to write them out by hand. Did I always type quickly? No! I type quickly because I have spent just about every day of my working career typing on a keyboard. Hours and hours of practice has made me a good typist. Years of putting together reports has helped me to figure out shortcuts for formatting them nicely – and quickly. I don’t know why I thought I would be a whizz a Minecraft on the first day. My daughter is great at playing Minecraft – but she also has a two year, 5 hour a week jump-start on me. Of course if you aren’t willing to even try Minecraft, you will never get good at it. And if you try it once, decide it is too tricky and abandon it, you will think that it is impossible to master. The trick to becoming good at Minecraft is committing yourself to spending a few hours muddling through the basics and slowly but surely getting a bit more skilful and a bit more confident. At the Minecraft: Education Edition training session we worked our way through Tutorial World – which teachers use the basic ways of moving yourself through the game. Because I had kept confusing my left and right mouse buttons I kept accidentally destroying blocks when I should have been creating blocks – and as a result had to go back to the beginning of the world three times. Whilst this was frustrating – on each successive attempt I got faster. I got better and better each time I did something. When I destroyed half our team’s structure in the build battle I apologised to the team and they quickly put back what I destroyed. I felt bad, but at other times other team members made silly mistakes. We had a laugh and moved on. Sure, we wanted to build a nice structure and win the challenge – but really Minecraft is just a game. 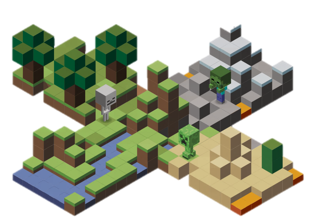 Check out the official Minecraft: Education Edition website for resources that cover curriculum and give learners an opportunity to play a game that they love at the same time. 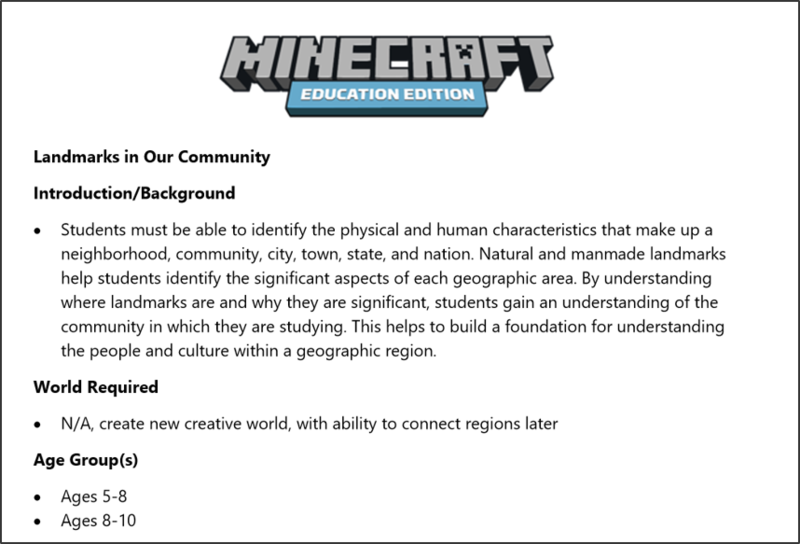 If you are interested in purchasing Minecraft: Education Edition for your school – please see here for more information. If your school already has Minecraft: Education Edition contact Megan Rademeyer (megan@schoolnet.org.za) for more info about professional development workshops for staff. This is the 25th post in the series "MIEExpert Spotlight" for South Africa. The tab with all the posts can be found at: http://bit.ly/1ZYy8Z7. Today we focus on Neliswa Zini. 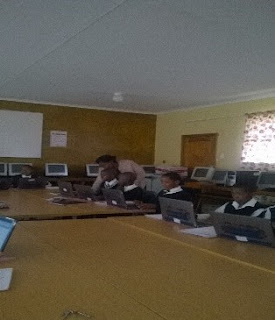 Neliswa has sent us this post about herself and how she started using ICT in the classroom. "My name is Neliswa Zini. I live in Queenstown in Eastern Cape Province in South Africa. I currently teach at Shiloh Junior and Senior Primary School, where I offer NS/TECH in Grade 4, Mathematics grade 5 and English (FAL), Social Sciences and EMS in grade 7. I started using technology in 2009. My husband introduced me to the PC. He taught me some of the basics. Then I used his desktop to compile my IQMS file. I only used Microsoft Word at that time. I realised that using a computer saves so much time as you don’t have to rewrite the whole document when you want to create a new one. You just edit it here and there. In 2012 I decided to do a Computer Clerk Course at Boston City Campus College. After that I bought my own laptop and did all my planning such as lesson plans, assessment plans, recording sheets etc. using Ms Word and Ms Excel. 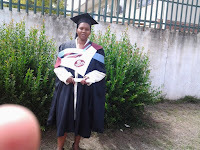 As an IQMS co-ordinator I conducted staff development through training workshops at my school. I used Ms PowerPoint for my presentations. 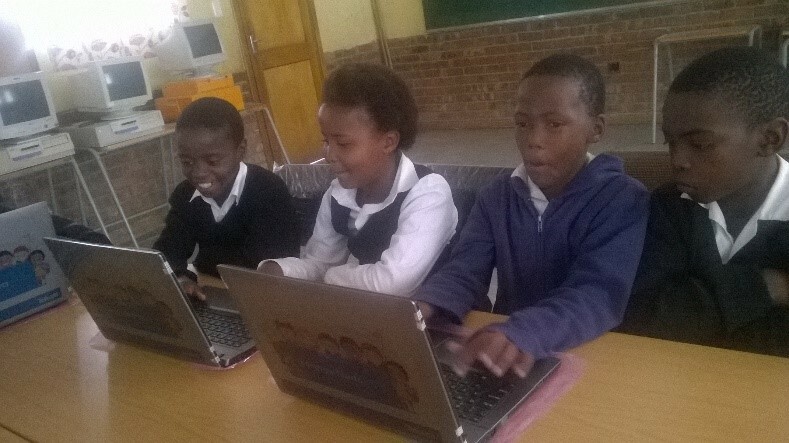 In 2014 Telkom Foundation Project donated 21 laptops to my school. That gace us a total of 33 technology devices because we already had a computer lab with 22 desktops. However, at that time our computer lab was not really functional. In fact it was only used by our computer teacher and the Admin Clerk! 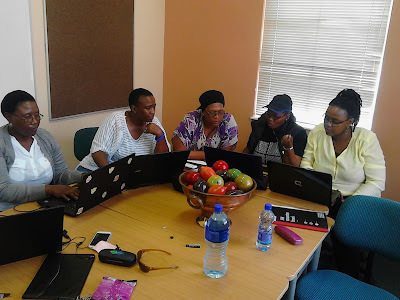 Then in 2015 Nosithembele Colleen Gcobo came with her team to train teachers in ICT integration at my school. She soon realised that I already knew what they were training. I ended up assisting them with the training. 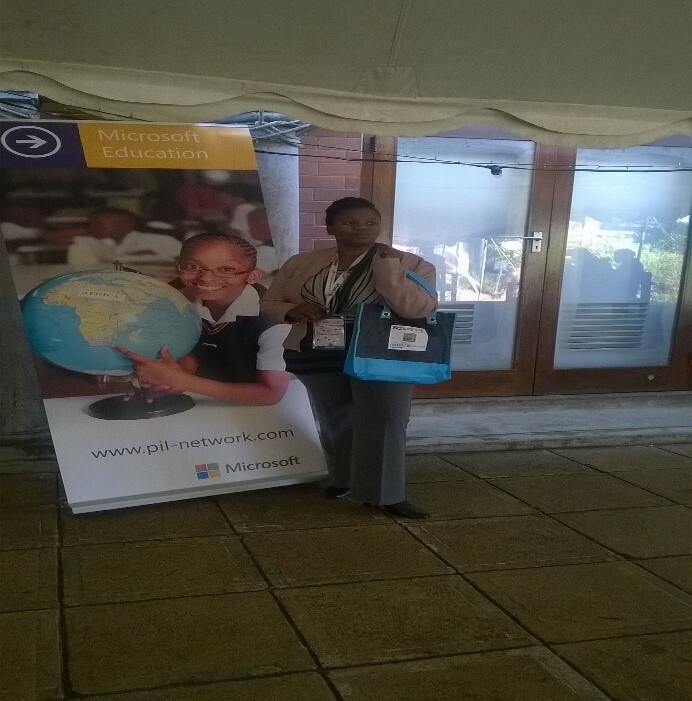 After that I was fortunately chosen to attend the SchoolNet ICT Integration conference in Durban. I learned a lot about teaching with technology at that conference. I was introduced to new Microsoft tools like Office Mix, OneNote, Sway, Movie Maker etc. I fell in love with technology and I realised that I was using my laptop as an expensive pen, as I was only using it for my planning. On my arrival back at school I started using technology in the classroom the way it was supposed to be (i.e. integrating technology into teaching and learning). I started by training my learners in computer basics. I planned an English (FAL) grade 4 lesson, reading and viewing using Movie Maker. I used an overhead projector and white board to display my lesson. My learners were so excited. Everyone wanted to give me the answer when I asked questions. After I finished teaching my lesson I gave them an assessment task and asked them to type their responses. This exercise helped my learners who usually have spelling problems. From then on I continued using technology in my classroom. I planned and taught Maths lessons – Long Division and Shapes - using PowerPoint. I also used Excel for teaching Data Collection – Charts. In May 2016 I attended a summit at Gauteng where I learned a lot more about technology. Since then my planning takes place using OneNote. Although I have the challenge of poor Internet access, I told myself that I was not going to stay discouraged by the Internet challenge for ever. I used my own router to connect to the Internet. Then I made a grade 4 NS/TECH lesson –Water cycle using Sway. I’ve shared my sway on Twitter and Facebook. 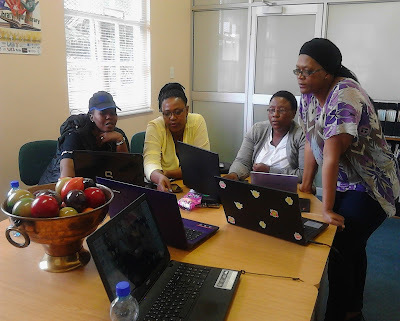 As a teacher who is always willing to share my knowledge, I invited my colleagues to the computer lab and trained them in ICT integration. I shared everything I’ve experienced with them. That motivated them to start to integrate ICT in their classrooms. Here is my principal with the grade 7 learners. I inspired my colleagues. I also showed them that technology can help learners who experience barriers to learning, particularly those with learning difficulties. Now Nosithembele Colleen Gcobo and I are planning to make a joint lesson whereby our grade 7 learners will work collaboratively on an English FAL project through Skype. We will use our own routers as we both experience an Internet access challenge at school. By doing this I am slowly becoming a part of a global professional learning network called #Make What’s Next starting with my neighbourhood. 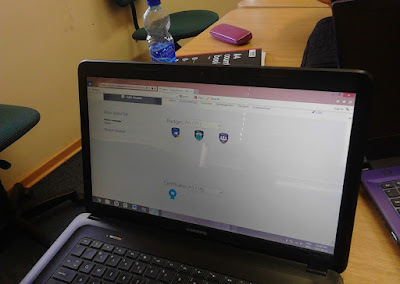 I also engage my learners in learning through gamification. While they play with cards in the classroom they learn counting in Maths without realising it. They also have fun at the same time. I conclude by saying that teaching with technology is the best strategy to slowly turn around the vicious cycle of failure experienced by learners with learning difficulties. When I talk about learners with learning difficulties I’m talking about those learners who are of average to above average of intelligence, but their achievement is below the expected outcome. They experience a difficulty in the acquisition of reading, writing and mathematical problems. Technology is the best mechanism to deliver deliver/implement the curriculum in ways that are relevant and meaningful to the diverse needs of all learners. Megan Rademeyer has been hosting a series of webinars on the Microsoft Virtual Academy on various Microsoft tools and how these can be used for educational purposes. Most of these sessions feature a Microsoft expert who is able to give tips for using the tools effectively – and a number of Microsoft Innovative Educator Experts have featured to talk about how they are using the tools in their classrooms. Click on the links below if you’d like to watch a pre-recorded session and follow @MicrosoftEduSA on Twitter for the links to the live sessions and to be part of the discussion about the tools.